Or click here if you can't see the navigation buttons down the left hand side. It's current controlled to make clear, stable colloidal silver that's rich in isolated ions and small particles! 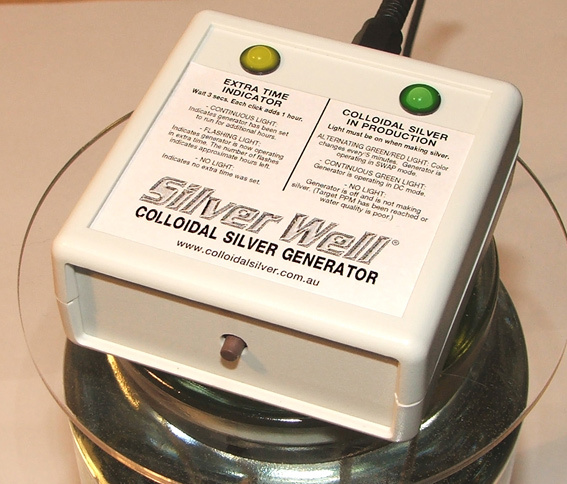 NO OTHER COLLOIDAL SILVER GENERATOR OFFERS SO MANY IMPORTANT FEATURES FOR THE PRICE! In addition to the Generator, Transformer, Stirrer and Electrodes, the Silver Well Kit includes an adaptor disc for wide mouth jars, filter paper, scrub pad, and complete operating instructions. All you supply is the water and the jars. 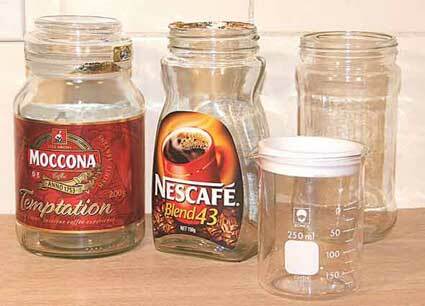 (Old coffee jars, any size or shape, are fine). The instruction booklet also includes chapters on Boosting the PPM in Auto and Manual modes, Water Quality and Water testing, Bottling Colloidal Silver, Speeding up the process, Alternative Power Sources, Using Lasers and TDS Meters, and Troubleshooting. Picture at left shows the Silver Well on a Moccona 200g/700ml coffee jar. Click on any photos to enlarge. The Silver Well is a unique 'Made for Australia' version of the famous Silver Puppy generator made in the USA by Coyote Zenterprizes. (No its not for puppies - it just has a funny name!) The Silver Puppy makes HIGH QUALITY, CLEAR, STABLE COLLOIDAL SILVER, RICH IN ISOLATED IONS AND SMALL PARTICLES as proven by published laboratory reports. The Silver Puppy is continually recommended and praised on colloidal silver discussion groups, and is the generator of choice for people who want to make the highest quality colloidal silver at home. But we've done more than just change the name for Australia. We believe the modifications made by Coyote at our request make this the best system available anywhere! 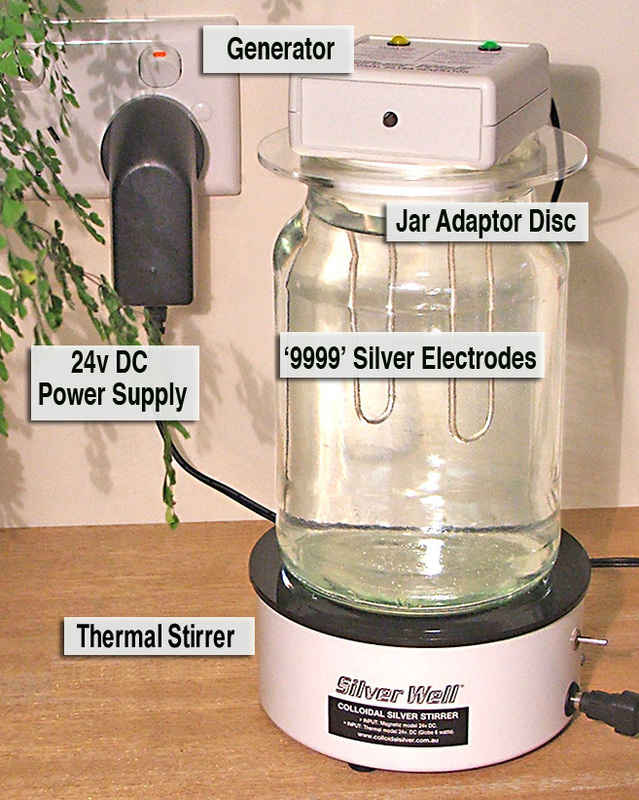 Now both the Silver Well generator and the stirrer run from a single 24v transformer (not directly on 240v mains power) and the case dimensions allow it to fit a wider range of jars and glasses. But the quality of the CS is exactly the same as the famous Silver Puppy. 30 DAY MONEY BACK GUARANTEE. If the Silver Well is not exactly what you want then pack it up within 30 days and send it back for a full refund. (Excludes return postage charge but you can make yourself plenty of colloidal silver to cover that!). 12 MONTH QUALITY GUARANTEE. The Silver Well Generator has a 12 month warranty against material failure. The Silver Well produces high quality clear Colloidal Silver every time then turns itself off automatically. You don't have stay around and watch it like a hawk. Cheap generators with simple circuits and timers can be a complete waste of your time and money because they can make CS that is so low in silver its useless, or they can produce a dirty grey batch and waste lots of silver because you forget to turn them off. The Silver Well (Silver Puppy) generator is regularly recommended and praised in Colloidal Silver Users Groups and other specialist CS websites because of its ease of use and reliability. The picture here shows the Silver Well Generator on an inexpensive, flat sided, 2 litre 'cookie' jar. I recently saw jars like this in a 'Reject Shop' for about $4. (Click the photo to enlarge it). The jar is sitting on the stirrer base. On top of the jar you can also see the clear plastic adaptor disc that is included in all kits. 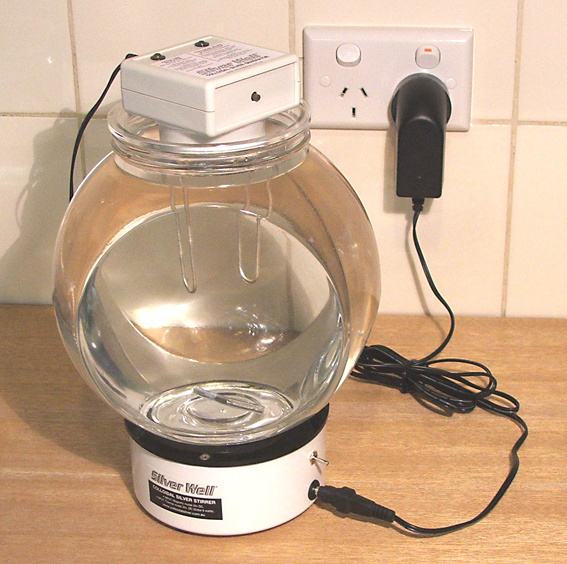 The adaptor disc allows the generator to sit on most 'wide mouth' jars. Its made for Australia and NZ so there's nothing else to buy. The Silver Well kit includes everything you need to make excellent quality colloidal silver at home - except the jar and the distilled water. You won't have to buy any special electrical adaptors, transformers or plugs, as might be the case if you order a generator from overseas. Auto and Manual settings lets you make high ppm CS. The AUTOMATIC setting on the Silver Well switches off the unit accurately at 12 ppm in any jar size. (It does this without any input from you. You just switch it on and leave it). This is a proven safe and effective strength. However if you want to make a stronger batch you simply pre-set the generator to run longer. We provide a simple table that tells you how much extra ppm is added per hour in a range of jar sizes. If you want 15 or 20 ppm thats no problem. You just give the button on the front a couple of clicks. It's very easy to make any strength you want. (Note however that about 30 ppm is the 'saturation point' of silver in pure water so anything above this becomes less stable). If stability or shelf life is not a concern then much higher strengths can be made. These high ppm batches are popular for topical (external use) such as in Gels. With a Silverwell you can make colloidal silver with strengths of 100's of PPM . Most competitor's generators with auto shut-off DO NOT HAVE A MANUAL MODE so you can never make a batch above their pre-set ppm limit. The MANUAL /EXTRA TIME mode also lets you over-ride the auto shut-off and make colloidal silver in any water of any quality. 'SWAP' alternating polarity, and DC modes. The Silver Well lets you choose between Square Wave Alternating Polarity (SWAP mode) that switches the current direction every few minutes or 'traditional' DC (one direction) output at the electrodes. SWAP is the default mode to make high quality clear batches but DC mode can be selected to make super strong 'fuzzy' batches for topical use. Read more about PPM on our 'Making CS. FAQ's' page. In particular, if you are interested in making high ppm CS, read the notes on using pure water. Includes 99.99% pure silver electrodes. The Silver Well kit includes two 7" looped . 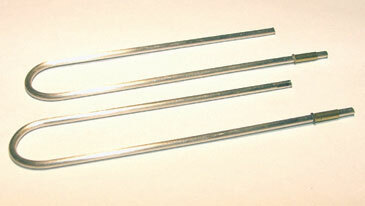 '9999' pure silver 12 gauge wire electrodes. Thats enough to make over 200 litres of the finest quality Colloidal Silver. NOTE. This is the thickest 'four nines' (.9999 purity) wire we can find. Slightly thicker 10 guage '3 nines' (.999) wire is available elsewhere but we don't think that's good enough. (Note, when comparing wire gauges - the smaller the number, the thicker the wire). Many other generators use thinner wire than this, 14 gauge for example, or flimsy flat silver strips. 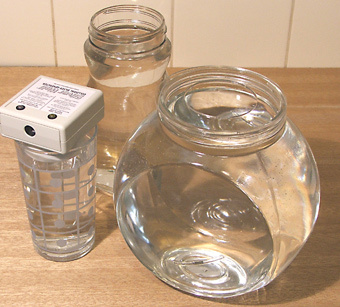 A pair of electrodes will make at least 200 litres of high quality colloidal silver at normal drinking strength. You just keep using them until they get too thin to handle. Our unique Current Control and Auto Shut-off circuitry automatically produces high quality colloidal silver containing safe trace amounts of silver regardless of a wide range of variables such as water volume, water quality, temperature etc. It also reduces silver wastage, so you get many more litres of colloidal silver out of a pair of electrodes. If you look closely at most other generator systems you'll see this entire vital component is missing! They have no real control system at all and simply feed the full power from the transformer or batteries directly into the silver wires. Our system uses an integrated circuit and a custom designed printed circuit board to constantly monitor and control the process of releasing silver ions and particles into the water. The Silver Well generator continually controls the power and varies the output as required. This produces quality colloidal silver regardless of the numerous variables that are inevitably present every time you make CS. The Silver Well generator only turns itself off once the required PPM has been reached. (About 4 to 6 hours per litre depending on water quality and temperature). Some other generators use a timer but most have no shut-off mechanism at all. And timers, on their own, are virtually useless for producing consistently high quality CS anyway. That's because the process is greatly affected by a number of variable factors such as water quality, water temperature, air temperature, water movement, electrode surface area, and especially water volume. A generator that shuts off automatically after a pre-determined time without actually monitoring the PPM may really be producing nothing useful at all! THIS IS IMPORTANT: Every other generator we have seen that costs less than the Silver Well is little more than a basic 'battery in a box' design that feeds the power from a battery or transformer directly into the electrodes. Some may have a light globe to prevent short circuits or a simple resistor to reduce the current but none have smart circuitry that continuously controls the current to produce high quality CS then switch off automatically at a proven ppm. (Let alone having a stirrer). We actually show you whats in our generator, most other manufacturers don't ... but for a typical example of a 'battery in a box' design see item 4 on our Links page. And we have also seen some other generators costing around a $100 that are simply a transformer with a couple of silver wires attached to the end. They give you no real circuitry, no current control, no auto-shutoff, and no stirrer. And they just give you vague instructions like "run it for a short while and it's done". These generators perform no better than a 9v battery and 2 silver wires. So don't be fooled into thinking that just because a generator plugs into the wall it's a smart generator! It's current controlled to make quality Colloidal Silver. 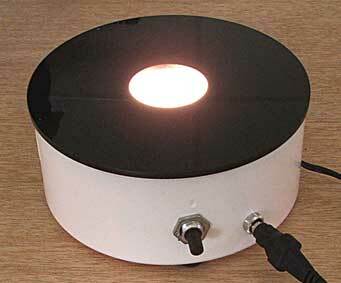 The Silver Well uses smart integrated circuit technology to control voltage and current. This control means the Silver Well makes beautiful clear,safe, colloidal silver then turns itself off automatically. Laboratory tests show that a typical 'drinking strength' batch of our colloidal silver to be approximately 85% ionic and 15% particles. The ions (like all silver ions) are just .129 nanometers across. Analysis by a professional laboratory shows the particle size ranges from about 5 nanometers to 132 nm which is considered to be very fine. The picture at left was taken in daylight, not in the dark. The red laser line through a glass of crystal clear Silver Well Colloidal Silver shows a dense (but not sparkly) 'Tyndall Effect' proving the presence of abundant very small particles. (See the 'TDS Meter and Laser' page for more info on the 'Tyndall Effect' and details of our optional laser pointer). CURRENT CONTROL CIRCUITRY PRODUCES STABLE COLLOIDAL SILVER. In addition to the small particle size, high ppm, and clarity, another major benefit of a current controlled generator is the stability of the colloidal silver produced. This means that the CS retains its high quality for a very long time in storage, it doesn't drop out of suspension, it retains a high ionic PPM, and it's far less affected by exposure to light. Particle size report - and proof of our claims. Making high quality, high ppm, clear colloidal silver takes hours not minutes. (The Silver Well takes about 4 to 6 hours per litre depending on water quality and temperature). Most other generator manufacturers make completely unsubstantiated claims about the speed, strength, or particle size of the CS they make. For example, any claim that a low voltage generator can make 1 ppm per minute of good quality CS from a 'standing start' is nonsense. Pure distilled or demineralised water, WHICH YOU MUST USE, is almost non-conductive so it takes quite a while just to get a reasonable current flowing between the electrodes. And then, as current flow increases, it must be controlled to ensure the slow release of ions and small particles. SO FOR ANYONE TO CLAIM THEY CAN RELIABLY PRODUCE A GLASSFUL OF QUALITY 5 PPM COLLOIDAL SILVER IN 5 MINUTES IS SIMPLY RIDICULOUS. (More likely after 5 minutes the ppm would still be near zero). Yes, the Silver Well produces 'nano particles' and 'micro particles'. Nano particles are within the 1 to 100 nanometer size. In a typical batch, 90% of the particles produced by the Silverwell will be less than 100 nanometers. ('Microparticles' is just a made-up word used by some generator sellers to hype up their product. Basically, all generators produce micro-particles). Don't confuse particles with ions! The Silverwell, like all generators, produces both particles and silver ions. 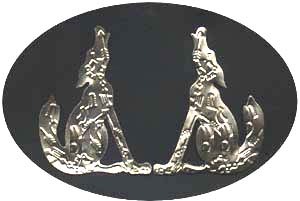 By design, approximately 85% of the silver in the batch is ionic. A silver ion is a single silver atom that has lost an electron. All silver ions are the same size, just .129 nanometers across, now matter how they are made. You can't get a silver component smaller than an ion. An ion is not a particle, but some producers will deliberately confuse the two in order to claim they produce extremely small particles. Ions and particles are two completely different and beneficial forms of silver and as such need to be considered independently. For more information about ions and particles theres a lengthy discussion at the bottom of 'Making CS' page. Easy to use, safe, and fully automatic. Thermal stirrer base for batches up to 2 litres. The Silver Well makes beautiful, clear colloidal silver with or without stirring, but the very best quality CS is made when the water is stirred. (Find out why in our 'Making CS FAQ's'.) The Silver Well 'Thermal Kit' includes a thermal stirrer base. Its a very reliable and economical way of using gentle heat and convection currents to continuously circulate the water during the generating process. 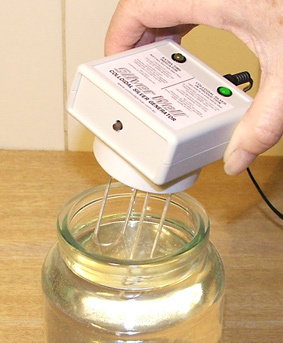 If you are just making CS for pets, topical, or household use you can use any jar up to about 4 litres. Read more about the importance of stirring on our 'Making CS. FAQ's' page. One of the most critical factors in the process of producing good quality colloidal silver is the initial purity of the distilled or demineralised water. The Silver Well generator incorporates features to help you test the initial quality of the water. In fact if the water purity is inadequate the Silver Well switches off instantly when in AUTOMATIC mode. For more info on the importance of water purity see our 'Making Colloidal Silver FAQs'. We also offer an excellent and inexpensive TDS (PPM) meter for testing the purity of the distilled water you buy. See our 'Making Colloidal Silver' page for recommended brands of water to use. 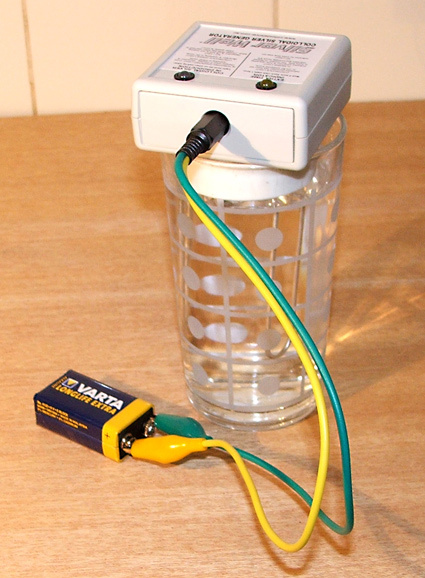 Energy efficient 24v DC power supply. The Silver Well comes complete with a quality, energy efficient, 'switchmode' type AC/DC adaptor that will run on any voltage from 90 to 264v AC. (So it will operate almost anywhere in the world with the appropriate pin adaptor). There's probably more technology in our transformer alone than in some entire generator systems. 24v provides 25-50% faster production times than 12v, and its completety safe because it keeps the 240v mains power right away from the water. Of course a major advantage of this system is that you can run it non-stop and never have to buy batteries. The pin style of this transformer suits Australia, New Zealand, Papua New Guinea, Fiji, Cook Islands, Kiribati, Nauru, Tonga, Vanuatu and Western Samoa. (Other countries wil need a pin adaptor). Please note this 24v transformer does not simply feed the power directly into the silver rods as you may see in some other systems. This power supply simply powers the generator. 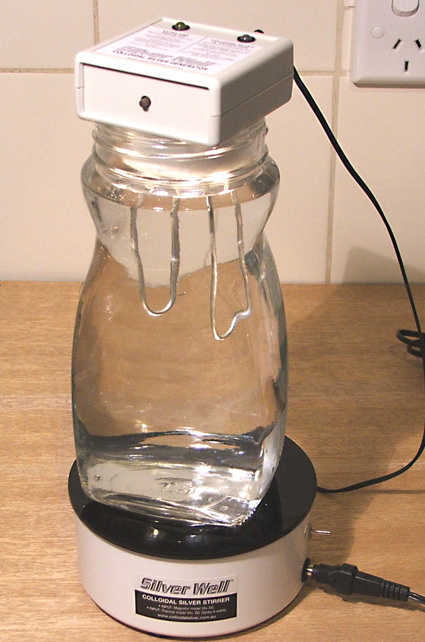 It's the Silver Well generator (the white thing on top of the jar) that controls the current into the silver rods by automatically varying the voltage as required. The Silver Well will plug into any of the white or black adaptors on this page.. Optional battery power leads for complete portability. Few high quality generators give you both mains power or battery flexibility, but the Silver Well can run off the quality mains power supply described above (included with the kit) or from the Optional Battery Adaptor Leads (just $5). These leads can connect your Silver Well to a wide range of DC power source from 6 to 36v - even from a car battery or a solar system. 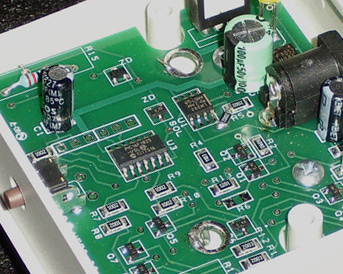 At left the leads are shown connecting the Silver Well to a common 9v battery. Portability like this is also great if you are travelling and want to sterilize the local drinking water supplies. No special beakers needed. Use any size jar. Adaptor disc for wide mouth jars. The Silver Well sits comfortably on just about any jar because we include a 10cm diameter adaptor disc for use on wide mouth jugs and jars such as this big 2 litre 'cookie' jar. 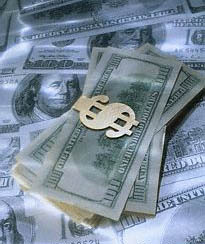 Our prices are all in Australian dollars including GST. Prices you see on U.S. websites may look attractive at first but once you add the exchange rate and the shipping cost you can lose any possible savings. 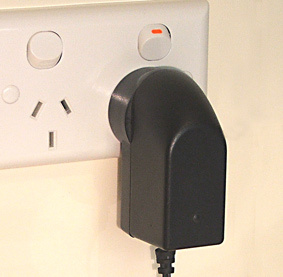 And then theres the cost of any electrical plugs or adaptors you may have to buy locally to get the thing to work on Australian voltage. Order a kit before noon Monday to Friday and we will do our best to send off your order that same day. (Orders received on weekends will usually be despatched on Monday). We use Australia Post Express Bags to deliver KITS weekdays to most capital city metro areas, usually within 48 hours. Outer metro and Country areas may take 48 to 72 hours, but that's still a lot quicker and safer than waiting for an overseas delivery that could take 2 or 3 weeks. For New Zealand orders we use Trackable Air Mail . Delivery is usually within 7 days. Freight charges and details are further described on our Kits/Prices/Order page. PLEASE NOTE. You can safely order at any time, even over weekends or holidays because we never process Credit Card transactions until your specific order is packed and ready to go! Copyright © Silver Well Aust. All rights reserved.